Creating Wild Spaces and Fun for the Cats at The Wildcat Sanctuary! Home » Creating Wild Spaces and Fun for the cats! We have big plans and you can be a special part of creating wild spaces for the wild at heart! Skywalk systems for leopards as well as other climbing cats like bobcats so they can use more vertical space in their habitats. Plan and redesign of Wildcat Pines section of the sanctuary, to be constructed in 2018. Wildcat Pines was the first area built when we moved to the site in 2006 and includes 10 habitats. It currently utilizes insulated and heated den boxes for native species such as bobcats, lynx and young cougars. The new design will include roofed habitats with more vertical space, no shared walls to allow more flexibility for non-socialized cats, and access to permanent, heated indoor areas. Renovated habitats for tigers Jeremy & Simon, Zeus and Sabrina. Their areas were renovated to include new trees, hammocks, multi-tiered platforms. Zeus received a lower pool so it is easier to walk into. Jeremy and Simon received a new cave made from boulders. Refurbish caves in Cougar Cove and Wild Woodlands sections of the sanctuary to maintain their integrity. 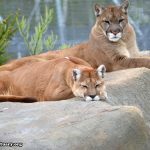 These are favorite lounging areas for cougars Raja and Liberty and lioness Shanti Deva. Shanti Deva is already enjoying her cave renovation and her hew platform and hammock. Raja/Liberty, Lindsey and Leisha received caves in early July. If funding permits, install two permanent pools in Wild Woodlands area of the sanctuary for tigresses Ekaterina and Nikita by late summer. Reconfigure Hybrid Haven to accommodate cats that want to live alone. We’ve accepted more and more hybrids into the program that do not want to share space with other cats. With your help, we just completed a new bungalow with three yards for Leo, Abby and Maximillion. This freed up another bungalow for Kona. Upgrade indoor quarantine enclosures to allow for more vertical space to accommodate larger cats. We installed permanent walls to aid in sanitation and drainage. This has already been completed with funds from the Miracle Match program! Plan and design of Animal Care Center to be constructed over the next 5 years. This will expand our hospital for better use of space and safe viewing areas that can be used for veterinary training. We acquired a new digital X-ray that can also be used in the field! This building will also host our animal care staff, overnight staff, volunteer area, and provide more education and training opportunities. Moving the hospital to this new building will allow us to expand our food preparation and animal supply storage. Investment in much-needed equipment to continue the best of care to our residents. Replacing older UTV’s will allow for more efficient feeding and maintenance. A large, new rescue vehicle is needed with lower miles for reliability on cross-country rescues, as well as the ability to pull rescue trailers. Other equipment procurement needed includes commercials mowers, back-up generator for new Feline Meadows Building and additional transport cat crates. 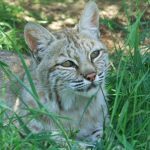 I invite you to join in building our future for rescued wild cats!